Rokeby was a prosperous Merino sheep farm in the early nineteenth century, and the traces of its agricultural past mark the landscape. Today walking trails wind through pastures where sheep and dairy cattle grazed and orchards where apples and pears grew. A neighborhood farmer hays fields. Nine historic outbuildings display a selection of tools and equipment that once powered the farm. Barn foundations, wells, stone walls, and a sheep dip all remain as reminders of Rokeby’s agricultural past. Rokeby’s 90 acres offer a number of opportunities for en plein air painting, drawing, and photography. Beginning May 19, 2019, artists are invited to visit and make art at the museum. Rokeby Museum Artist Membership provides access and resources to artists wishing utilize the museum for art-making. 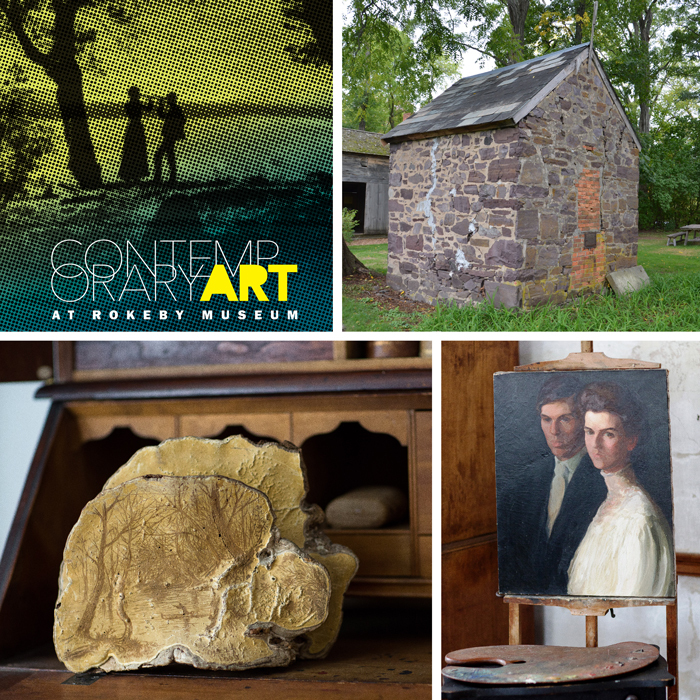 Designed for painters, photographers, illustrators, and other artists working two-dimensionally, Rokeby Museum Artist Membership is one of two programs that engage with artists. Artist members will be invited to exhibit their work at the Art Rokeby Festival in August. In May 2019, Contemporary Art at Rokeby Museum begins an ambitious two-year project designed to engage artists and the public with Rokeby Museum archives, objects, buildings, and land. Project activities will demonstrate how contemporary art can pick up the unfinished work of history and foster civic engagement in social, economic, and environmental justice issues. Contemporary Art at Rokeby Museum will present two exhibitions, introduce an artist membership program, conduct a symposium about the relationship between art and history, and host an artist lab designed to support the development of an artist’s practice. Artists will be invited to make art at or about Rokeby Museum and their work will be shared online and at a festival in August. Contemporary Art at Rokeby Museum is a collaboration with Kasini House.